Cracks appeared on Tuesday within junior coalition partner Independent Greeks (ANEL) over the Macedonia name deal after one of its lawmakers differentiated his stance from that of party leader Panos Kammenos. The ANEL leader said on Monday that if the deal signed between Greece and the Former Yugoslav Republic of Macedonia (FYROM) is brought to Parliament it could spell the end of his party’s coalition with SYRIZA. However, speaking to Focus FM radio in Thessaloniki on Tuesday, ANEL MP Thanasis Papachristopoulos begged to differ. “I disagree with what Kammenos said about bringing down the government,” he said, adding that he feels “outside ANEL” due to his disagreement with its stance on the name deal which he said will benefit northern Greece and promote growth. With regard to speculation that he is on the verge of transferring his political allegiance from ANEL to SYRIZA, he said he has not spoken to anyone from the leftist party. “I am with those who target corruption and vested interests,” he said. Meanwhile, Costas Zouraris, a former deputy education minister and outspoken critic of the deal, said that it should not lead to the government’s downfall if there is a parliamentary majority in favor. 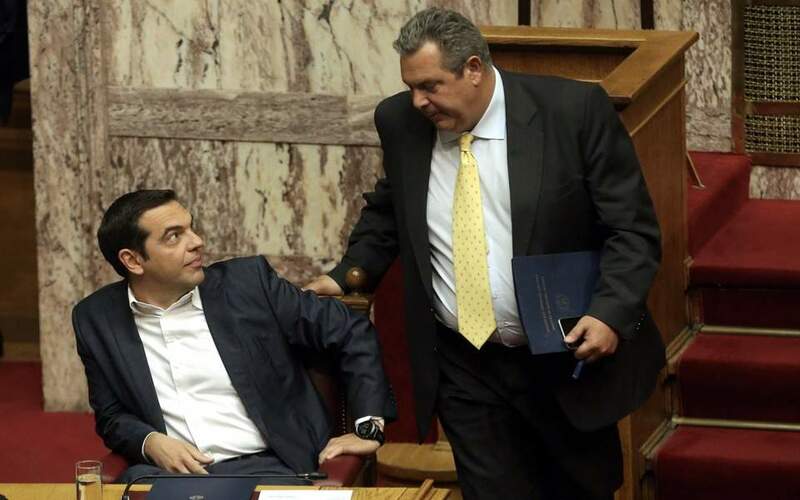 “If a majority votes [in favor of the deal], there is no reason for Kammenos to withdraw his confidence in the government,” he said. Nonetheless, another ANEL member, Costas Katsikis, was adamant on Tuesday that the party has already made up its mind to “bring the government” down over the deal even before it reaches Parliament for ratification. For his part, government spokesman Dimitris Tzanakopoulos said that Kammenos’s position “has been known and respected” for the last eight months but “will not create problems for the government” and the deal will pass comfortably in Parliament. Maximos Mansion is reportedly counting on independent MPs and To Potami’s Spyros Danellis, who has indicated he will vote in favor of the deal. Digital Policy Minister Nikos Pappas also expressed confidence that the government will not fall over the deal and that Kammenos and his MPs must be convinced of its merits. He also said he was optimistic that To Potami will stick to the position that the deal must be ratified by Parliament.